The BSAVA Manua of Canine and Feline Emergency and Crititcal Care remains a highly practical resource. Retaining the structure of the previous edition, each of the chapters in this third edition has been throughly revised to reflect current thinking and pactices. The introductory chaptes, covering areas such as triage, catheterization and the assessment of shock and dyspnoea, sit alongside chapters that cover system specific emergencies, ranging from cardiac arrythmias to uterine prolapse, and from corneal ulceration to factures and luxations. The text is fully illustrated throughout. Contents. 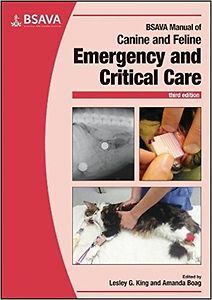 Triage of the emergency patient; Vascular access; Assessment and treatment of shock; Fluid therapy; Electrolyte and acid–base balance; Cardiovascular emergencies; General approach to respiratory distress; Renal and urinary tract emergencies; Neurological emergencies; Ophthalmological emergencies; Approach to gastrointestinal emergencies; Acute abdominal and gastrointestinal surgical emergencies; Haematological emergencies; Transfusion medicine; Reproductive and paediatric emergencies; Endocrine emergencies; Acute management of orthopaedic and external soft tissue injuries; Dermatological emergencies; Toxicological emergencies; Cardiopulmonary resuscitation; Anaesthesia, sedation and analgesia of the critical patient; Nutritional support of the critical patient; Bacterial infections in the critical patient ; Imaging techniques for the critical patient; Team approach to the critically ill patient – the role of the veterinary nurse; Index.